Minnesota does not require continuing education hours at this time but you can still experience the benefits of adding Spontaneous Muscle Release Technique to your practice without having to purchase CE credits by taking advantage of our DVDs or Downloadable Webinars. State Contact Number Minnesota State does not have a statewide agency or board to oversee the licensing of Massage Therapists. 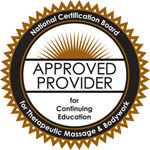 Contact your city or county clerk to find out the requirements for conducting business as a Massage Therapist.